I love painting my nails. A lot find it a task or something they would rather not do but I get great joy of having a new , freshly painted manicure to enjoy and the fact that I done them myself makes me feel a sense of achievement. I do get a lot of complaints on my nails often mistaking them for gels which is probably down to my trustworthy Seche Vite Topcoat. Over the years I have come across and researched nail products that will make my manicure as professional as possible with minimal effort required. 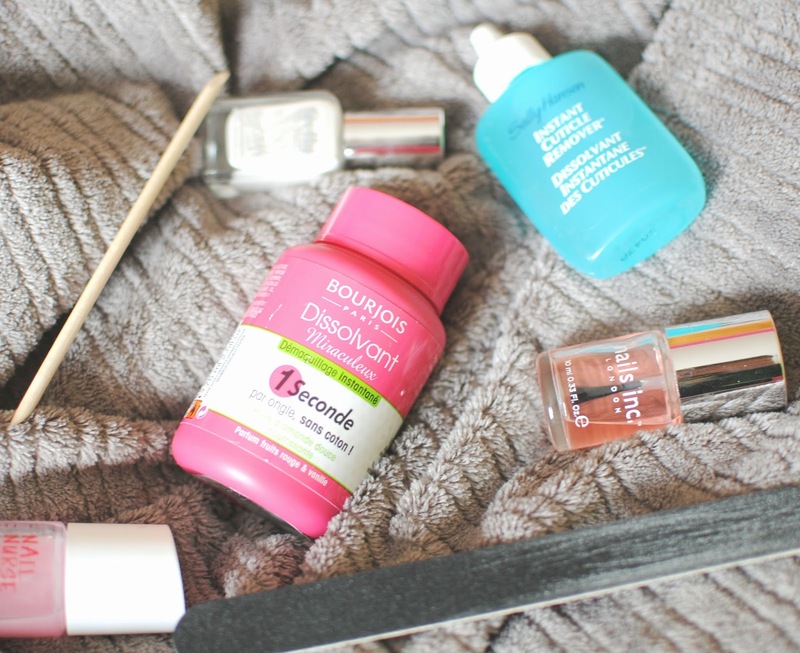 If I have been wearing polish I love to use the Bourjois Magic nail polish remover which only requires you to twist your finger into the pot and like magic it comes off with ease leaving behind a berry scented oil. I always begin my manicure by removing my cuticles and the product I use to do this is the Sally Hansen Instant Cuticle Remover which isn't shy in the blogging world. After seeing Anna rave about this product I thought it was worth a try. Did I think it would work? No, but I was happily proven wrong with it quite literally melting your cuticles away without pain or fuss with the help of a wooden cuticle pusher. If I am really in the mood I will go on to file my nails into a square kind of shape which I am really liking at the moment. I then apply my base coat, I'm currently using a Rimmel London nail nurse one but I am not really getting on with it and am very open to recommendations for my next purchase! The nail colour will follow after. I recently bought Barry m's Coconut which is a creamy white shade. To finish I usually apply my Seche Vite topcoat but when I have run out and can't afford a new bottle straight away I tend to use Nails Inc's Cavier Topcoat a great alternative but one I probably wouldn't repurchase. What do you use for your manicure ? I really like Nails Inc nail polish when I do my nails. I love your blog and I have followed you with Bloglovin. If you ever get a chance to check out my blog I would be delighted, thanks! I really love the color of your nails. Also I have to agree with all the compliments you get on your nails. They really look amazingly well done. I wish I could do mine as good.